This is the English companion to my French reader Je mange. 1. The reader with coloured pictures.This is great for young children who like bright pictures. There are two readers per A4 page which is perfect for teachers using the readers in their classroom. 2. The reader with black and white pictures. The pictures are left black and white so that children can colour the pictures as they read their way through the reader. This is great for children who need a little incentive to read or for teachers and parents who need a quiet activity for children who are more independent readers. There are two readers per A4 page which is perfect for teachers using the readers in their classroom. 3. 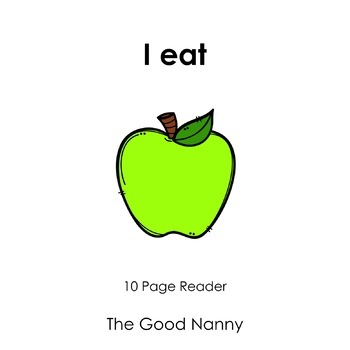 The reader with black and white pictures and tracing font.The pictures are left black and white for children to colour and the key focus of the reader is written in tracing font. This allows children to practice writing the phrase or word that is being explored in the reader. There are two readers per A4 page which is perfect for teachers using the readers in their classroom.